A little Christmas present for all our dear readers, courtesy of Rachel Manke. An old Mills Brothers tune, On This Christmas Eve. Finally, the kind of story we like to sink our teeth into around here at Ukulelia. We recently ran across this video of an unidentified ukulele player, which is remarkable for several reasons. Here's what seems to be known about the film. This early talkie was produced by Theodore Case, inventor of the sound-on-film system later marketed as the Movietone sound system. Movietone's big competitor was Vitaphone, which relied on sound recorded on phonograph-style disks, and which required a certain amount of skill on the part of the projectionist to ensure that the sound was synched up with the film. Because Movietone recorded audio to the film stock directly via an optical process, the result was superior synchronization. "A variety performer dressed in traditional Chinese garb sings “Yes Sir, That’s My Baby” while accompanying himself on ukulele." Here's the only photo we've been been able to find of Nee Wong, from the sheet music cover of There's a Little White House on a Little Green Hill. 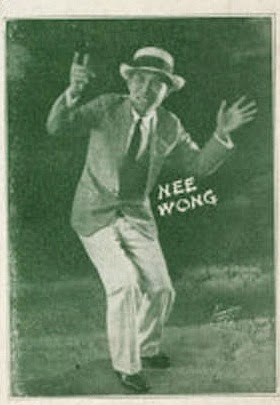 This is the best resolution we could achieve, but we're pretty sure that based on date of the sheet music (1926) and the descriptions of Wong's act that we're looking at the same performer here as in the video. Back to the video. What we love about this short is its high resolution and excellent audio synch. (Compare it to the early Vitaphone short we unearthed seven years ago here.) Wong plays with a finger-thumb double strum technique that we often hear on recordings of Wong's contemporaries like Frank Crumit. Take advantage of YouTube's playback speed options to watch Wong at half-speed (click on the little gear icon). The audio remains synched at normal pitch and you can see exactly how he's executing his strums. If anyone has any further information about Nee Wong, please leave a comment or drop us an email.